Let me say this right from the start: Microsoft Word 97 was a REALLY good word processor. I might even say, the best word processor I have ever used, though Google docs starts to come close. 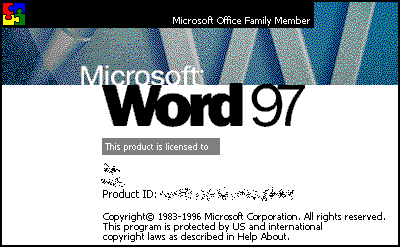 And also, Word 97 was the first (and last) Microsoft word processor I had a legal copy of. There were even more cool Hebrew fonts on the CD itself, if you only knew where to look, and I looked all over the CD. Maybe I was a little too enthusiastic on that account, but still, it was a heck of a good deal. It only cost me something like 30$ on the computer store (gone since then) at the Hebrew university, up on Mount Scopus.